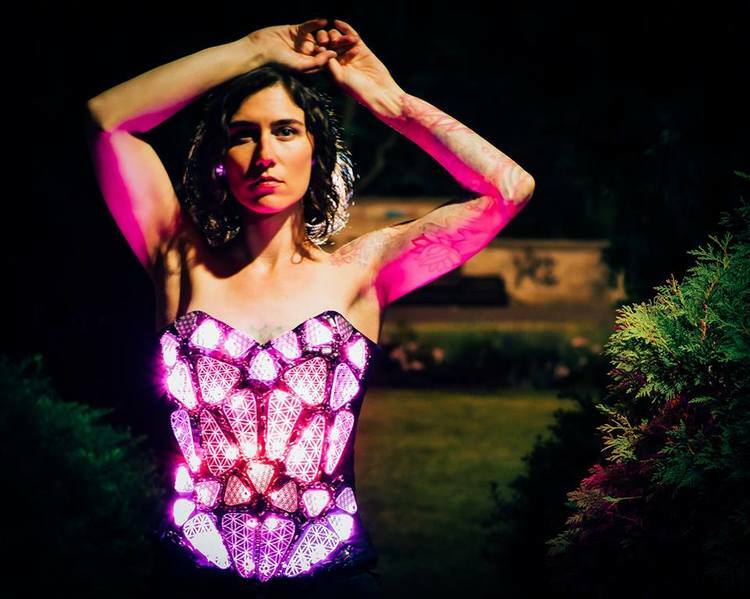 Made up by members Stacey Morgan, Kenzie Housego and Sophie Amin PHI : Illuminated Design is a new-media collective focusing on performance, wearable art, and wearable technology. Interested in the crossroads between art, fashion, and technology, PHI is constantly seeking methods and media that engage and empower cultural participants through technology. Gamergirls features two identical, sleek, feminine dresses where the wearers are able to compete in a video game played out on the opposing person’s garment. Each garment is overlaid with a detailed track pattern mimicking the familiar arcade style gaming displays. The game is controlled using a Bluetooth LE wireless phone app, incorporated as an accessory. More here. Gilded Fractals Collection is a wearable tech collection inspired by the amazing shapes and sacred geometry found in nature. This elegant feminine collection features designs and accessories that reacts to both the wearers environment, movements and an iPhone app interface. More here. The Illuminated Vintage collection presented bright classic dress designs, and accessories -- think fascinators and parasols -- that all react to, sound, touch, movement, or the wearer's heartbeat. More here.